What if the Tony Lopez Situation Occurred in Canada? So what if a situation like this took place in a sanctioned bout in Canada? What kinds of repercussions could an athlete be exposed to? In addition to suspension from the governing athletic commission, criminal charges would not be out of the question. You need look no further than the aftermath of the McSorley/Brashear altercation or the Bertuzzi/Moore incident to recognize that Canadian law sets limits to consent in sports. Even when a bout is properly sanctioned by an appropriate athletic commission this does not suspend the assault provisions of the Criminal Code. Under section 265 of the Criminal Code a person commits an assault when “without the consent of another person, he applies force intentionally to that other person, directly or indirectly“. A tap out and referee stoppage are two recognized ends to an MMA bout. When either occurs the consent to contact ends. If force is “intentionally” applied after either scenario and if the force “clearly extends beyond the ordinary norms of conduct ” a criminal conviction can be secured. MMA and combat sports are regulated activities and the application of the Criminal Code does not stop in the ring or cage. 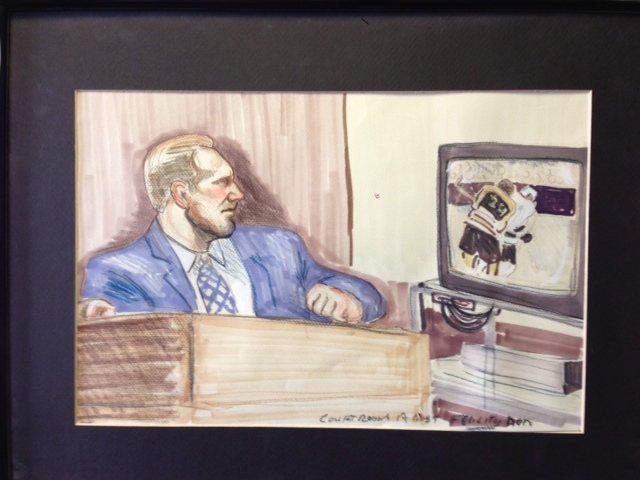 As the below courtroom sketch reminds us, if an athlete crosses the line criminal prosecution remains a reality under Canadian law.